You know the smell: wetsuit funk. 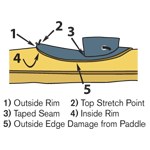 It’s not pretty, but it is preventable – and so is the chorine and salt damage that shortens the life of your expensive Neoprene equipment. Just use Wetsuit and Drysuit Shampoo on booties, gloves, fishing waders, LYCRA® body wear, and of course, wet suits and dry suits. Our Wet suit and Dry suit Shampoo works fast to remove organic residues like algae and bacteria, plus chlorine and salt deposits – so your Neoprene equipment smells fresher, stays supple and lasts much longer. 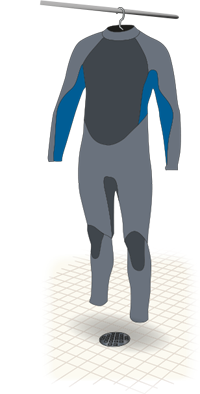 Remember, cleaning wet suits means less funk and more fun. 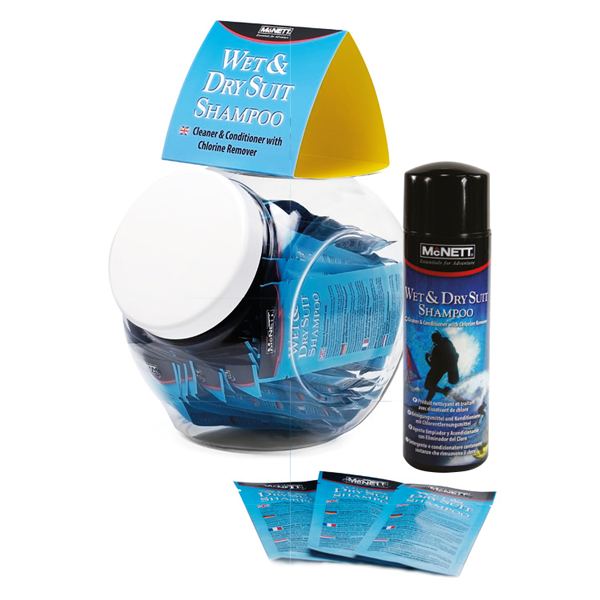 Wetsuit and Drysuit Shampoo™ is part of the McNett M ESSENTIALS™ product range. 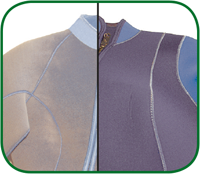 Regular cleaning with Wet & Dry Suit Shampoo prevents chlorine and salt damage (left half of photo) and keeps suits looking and feeling like new (right half of photo). 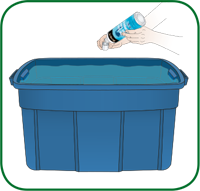 Find two clean large containers – one for washing and one for deodourizing. 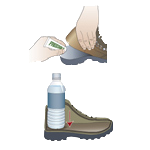 STEP 1: Fill both containers with enough warm or cold water to submerge your suit. 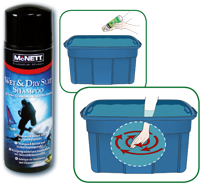 To the first container, add 2 capfuls (15 ml) of Wet & Dry Suit Shampoo per 4 litres of water. 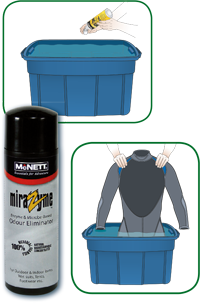 For extra suit conditioning, add a few teaspoons of Silicone Pump in with your Wet & Dry Suit Shampoo when washing your suit. 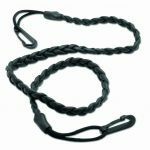 maintains suit suppleness, keeps colours bright and eases suit entry. 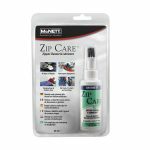 (15 ml) of MiraZyme™ Enzyme Based Gear Deodorizer to the second container. For stuborn odours, apply MiraZyme directly to problem areas with a spray bottle. STEP 4: Dip suit to saturate all areas. Remove from container. DO NOT rinse. 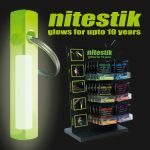 as well as algae, bacteria, pollution, waste matter and urine, leaving your suit odour-free.